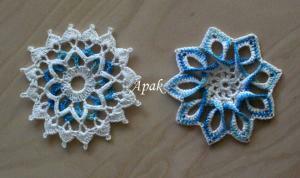 The patterns are from Polish crochet magazine. Oh my, what intricate detail! So pretty! So pretty and blue. I love them. It seems like they have more thread patterns available in your part of the world than we have here. The thread patterns that I do have are fairly old. They are beautiful and they look great on my tree. They are right up front for all to see. They are even prettier in person. Oh Anna, those are just beautiful!!! love the blues and white! Wow, I won't pick a favorite but that one on the right.......with the pinwheel look .....is like nothing I have ever seen before in crochet! You are very talented! Wow! those are incredible!! Well done indeed! Oh Anna, those are gorgeous! The snowflakes are beautiful. Wish there were snowflake patterns like these available here in US.